Troubleshooting Kubernetes to GCP Mongo Atlas connectivity – so where do you start? We believe that Istio is not correctly routing traffic when it comes to replica set hosts, and is using the host list in the service entry for load balancing rather than just a List of nodes which can be talked to externally. This is a big problem for a clustering based data store such as MongoDB where connection flow is incredibly important. This is a hypothetical theory we have rather than something that has been concluded. As a result of this issue we are no longer using the outbound port whitelisting feature in Istio, as it turned out this feature had been the cause of a few unrelated issues in our environment. Although the post below is still valid in terms of troubleshooting possible connectivity issues, we are no longer using Service Entries to for outbound traffic interception. In the last few weeks, We have started to prove out running a latency sensitive application in a k8s container against a database running on mongoDB Atlas which is also in GCP. We currently have a service running in Kubernetes in a europe-west4 container, but the metrics are showing that it runs around 5x slower on average when it connects to an on premise mongo database running 3.2. Get used to hearing and seeing this both in the documentation, and when discussing with Support or Account Managers. As expected, not all features are available in GCP yet, the main ones that are frustrating us (As of August 2018) are VPC Peering and Encyption at Rest. Atlas supports VPC peering with other AWS VPCs in the same region. MongoDB does not support cross-region VPC peering. For multi-region clusters, you must create VPC peering connections per-region. Depending on the volume we push to and from our databases, lack of support for VPC Peering may be cost prohibitive as you end up paying egress costs twice, both as your data leaves your K8s application project for data entry and also when it leaves GCP Mongo Atlas on data retrieval. Mongo generally give a cost estimation of 7-10% of cluster size for Egress costs. Continuous Backups are not supported. When enabling backup for a cluster using Encryption at Rest, you must use Cloud Provider Snapshots from AWS or Azure to encrypt your backup snapshots. You cannot enable Encryption at Rest for clusters running on GCP. So, currently we cannot take advantage of this option because we would eventually want to run backups via Atlas. Administrators who deploy clusters on GCP and want to enable backup should keep those clusters in a separate project from deployments that use Encryption at Rest or Cloud Provider Snapshots. However, the application was failing its readiness check (healthcheck on pod startup could not connect to the mongo database). Kubernetes is not easy to diagnose issues in – especially for novices like me! Using kubectl logs on the pod was not a great help in this instance, but that might be down to application configuration and what it sends to stdin, stdout, stderr (which is the basis of kubectl logs). [24/Aug/2018:13:29:17] ENGINE Started monitor thread 'Autoreloader'. [24/Aug/2018:13:29:17] ENGINE Started monitor thread '_TimeoutMonitor'. We knew our readiness check was failing on connectivity so runnng an Interactive bash terminal inside the pod and trying to make a connection to the Atlas replica set without the application was a fair shout. Then I generated a manual mongo uri connection using python (the application runs in python) and tried to retrive the database collections. Failing without the application – thats a good sign as it now allows us to do some quick fail fast testing with the uri connection code above! and run the same uri mongo connection as before. Doing this gave the same python connectivity error shown early in the post. Again, this is a good sign as now we have moved our issue to a less strict environment where we can test changes better. Can we test the same thing without the istio sidecar…sure! Then re-create the pod and go into an interactive terminal with bash. Retry the mongo Uri…and it worked! so this narrowed it down to something we potentially hadnt configured in istio. Changes from service entry’s are immediate to pods. We re-added the istio sidecar annotation into our mytestpod.yaml file and redeployed. This time, even with Istio, the mongo connection worked fine and retrieved the data. Defining a whitelist can be very tricky as providing a google IP range for our K8s applications is more or less impossible – or would cover most of the internet! The reason for this issue is that only the DNS is static for K8s services, so the IP for an application pod can change multiple times a day, meaning its more or less impossible to assign a strong IP whitelist bound to applications unless an automated check is implemented. We have several different viewpoints here internally, ranging from we should have a structured IP whitelist to why do we even need a whitelist? Our Authentication and Encryption should be at a level that it can run securely with a 0.0.0.0/0 IP Whitelist. Bear in mind that you may have an on premise firewall between your laptop and Mongo Atlas and may need your network administrator to enable access for you to go outbound on 27017 to your Atlas Nodes. Have an environment where you can potentially break stuff. An infrastructure testing area of some kind. Q: Is it possible to count distinct values of a field in mongodb? A: Yes! This can be done via the aggregation framework in mongo. This takes two group commands; the first groups by all the distinct values, and the second does a count of them all. 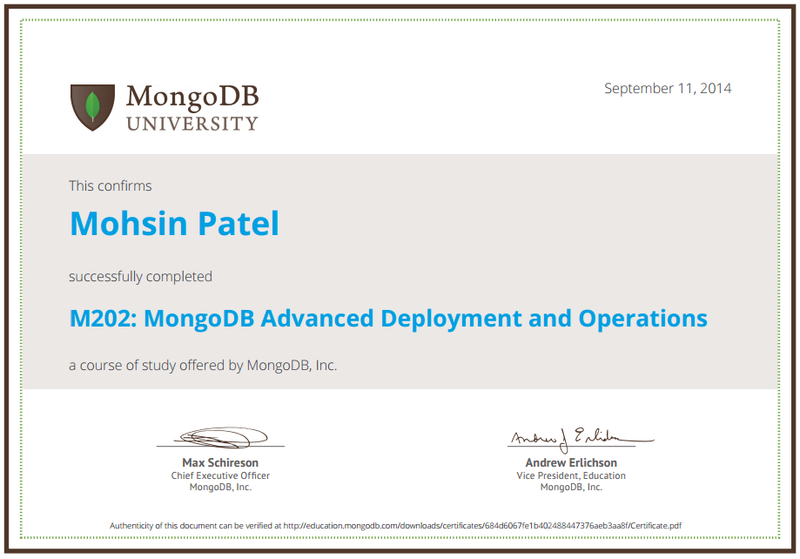 Passed my M202: MongoDB Advanced Deployment and Operations Course! The one caveat with this is that on a system with many secondary’s, there can sometimes be latency between the master and secondary’s which may result in stale data. slaveOk works on the proviso that the user is happy reading data based on eventual consistency. which means that the mongod process was started as an uninitialised replica.